The Clear Lake north pool is a quintessential Oregon dive site. 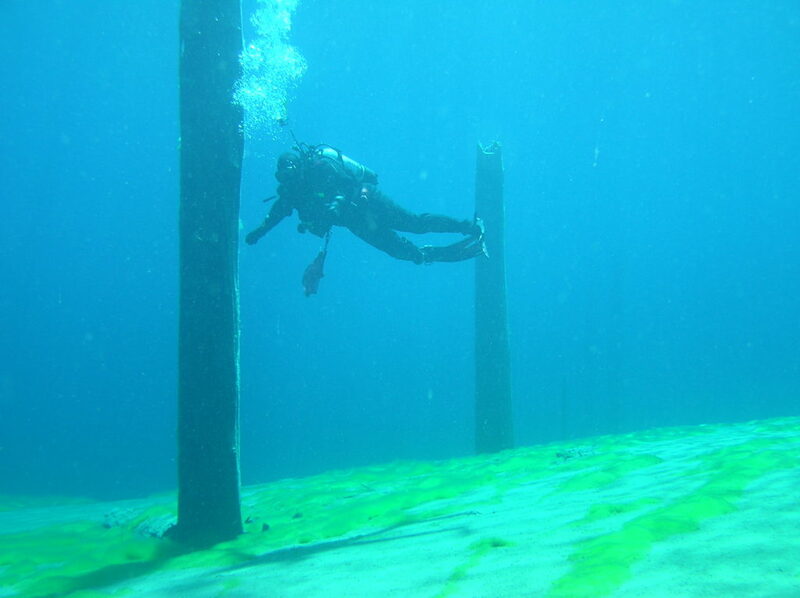 SCUBA divers have enjoyed the 100+ feet of visibility, easy walk-in shore diving, quiet non-motorized lake. The highlights of the lake are a sunken and flooded forest still standing after hundreds of years and a series of underwater springs pushing out thousands of gallons of water of cold, clear water every minute. The McKenzie River starts at Clear Lake and flows all the way down to Eugene where it meets the Willamette. This is a great day trip dive from Portland or the Willamette Valley. The north pool of Clear Lake as seen from the south shore near the lodge and cabins. People come to dive clear lake for the amazing visibility. 100+ feet is common and at the right time of year (usually fall before the winter storms start), visibility can hit 200+ feet. The north pool is shallower than the southern part of the lake, making it more friendly to divers who don’t want to prepare for frozen or free-flowing regulators. There are a few sunken trees from the ghost forest at the bottom of Clear Lake but the main underwater attraction (aside from the viz!) is the big potholes in the bottom of the lake where huge springs come out underwater. The spring water is usually very cold although during heavy snow melt conditions, the surface layer of water can be colder. The small lodge at the southern end of this dive site usually has good hot chocolate and warm food available. Clear Lake is in the middle of nowhere. Eugene, Bend, and Salem, Oregon are the closest major towns. Make sure that your gas tank is topped up and you have everything you need for a day of diving before you head to Clear Lake. Coming from Eugene, the McKenzie River Highway (State Highway 126) is the most direct route. Coming from Portland, the North Santiam Highway (State Highway 20) is fastest. At Santiam Junction, follow the signs for Eugene onto (briefly) US 20 West and then State Highway 126. From Corvallis, US 20 East (South Santiam Highway) to State Highway 126 is the fastest. From Bend, take US 20 East and follow signs for Eugene onto State Highway 126. Follow signs for Clear Lake Resort and National Forest Road 775. The road is one-way. You must enter from the southern end of the road. There are signs clearly visible from the highway pointing the way. You will be turning to the east to get onto the access road. Day use parking is limited at the site. As of writing this, day use parking is free. However, parking is limited. In the fall, winter, and spring, we have never had a problem finding parking on the weekends but in the summer, parking is a challenge even on weekdays. Be sure to follow posted signs. Some parking is restricted to overnight guests of the lodge. Imagery © 2017 Google, Map data © 2017 Google. Clear Lake North Pool Site Overview. Note that the access road to the lake is one-way. The northern end of the access road (lower right in above image) a one-way exit. The southern end of the road (1/8 mile further south, not shown) is the entrance. The site is not too big to get lost in and with superb visibility, it’s easy to orient yourself underwater. The boat dock is an easily recognizable landmark to show you where the southern boundary of the dive site is located. If you go further south, you’ll end up in the much larger main pool of Clear Lake and will encounter the huge sunken forest. The main entrance and exit that divers use on this side of Clear Lake is south of the lodge and docks. There is a short walk down a path from the day use parking area to the entrance. The entrance is easy and straight forward. However, entering here will give you a long surface swim fighting the current to get past the docks. Depending on the time of year, the people in the lodge can give you permission to enter and exit at the boat ramp. Ask nicely and they probably will say yes. In the summer when there is a lot of (non-motorized!) boat traffic, they probably will not let you enter or exit on the boat ramp. There are a few other more difficult to find options to enter and exit to the west of the boat ramp along the north shore pool although you have to walk by the cabins to get there. The people at the lodge generally frown on people cutting through the cabins to get access to the lake. This is a shore dive. You could use a non-motorized boat in the north pool but there isn’t much point. It makes more sense to use a boat in the main pool. Conditions at Clear Lake are usually very good, aside from the cold water. There is a current by the boat docks that will slowly push you down into the main pool. The springs at the bottom of the lake push out enough water to make a gentle current near them. Visibility is usually 100+ feet and can sometimes be 200+ feet. While there is sand and silt on the bottom, the current quickly takes it away and anything remaining quickly settles. 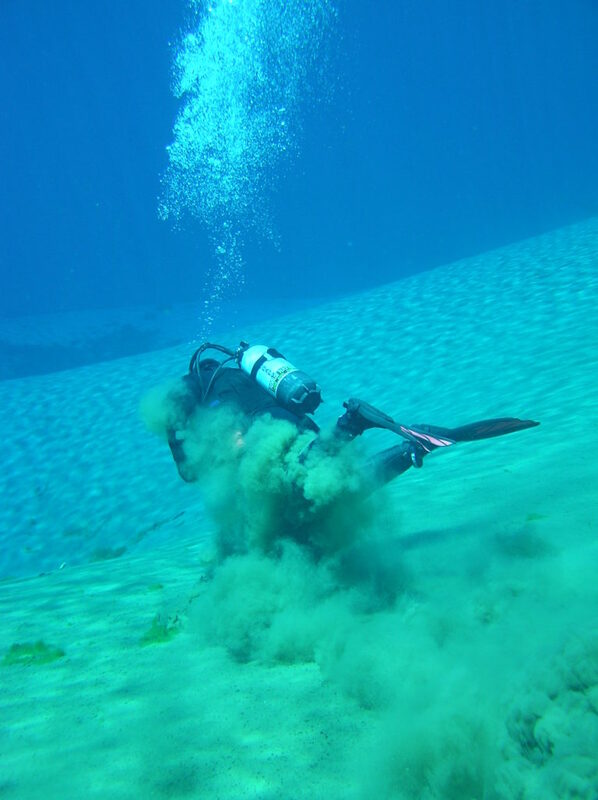 The photo below shows what it looks like when you crash into the bottom because you were paying more attention to your camera than your buoyancy. The silt and sand on the bottom of Clear Lake can reduce visibility but not enough to cause a major problem. Maintaining good buoyancy is a good idea though! We have seen it as high as 40F at the surface after the water has been warmed by the sun and as low as 32F in the potholes were the springs are located. We have gone diving at this site with several feet of snow on the ground and in the hot sun. The water temperature is always COLD! Be aware of how your dive gear performs in very cold water. Some regulators can free flow or otherwise freeze due to the cold. We had this happen to us once in the main pool of Clear Lake. Fall, winter, and spring are the best because there aren’t any crowds and you won’t overheat in your drysuit or wetsuit while you get geared up to go diving. In the bottom of the potholes where the springs are, you can hit 90 feet. The rest of the bottom averages between 45 and 65 feet. REMEMBER this is an altitude dive! You need special training to dive at altitude! If you want to venture into the potholes, you should have advanced open water or deep diver training. You should have altitude diving training as well. 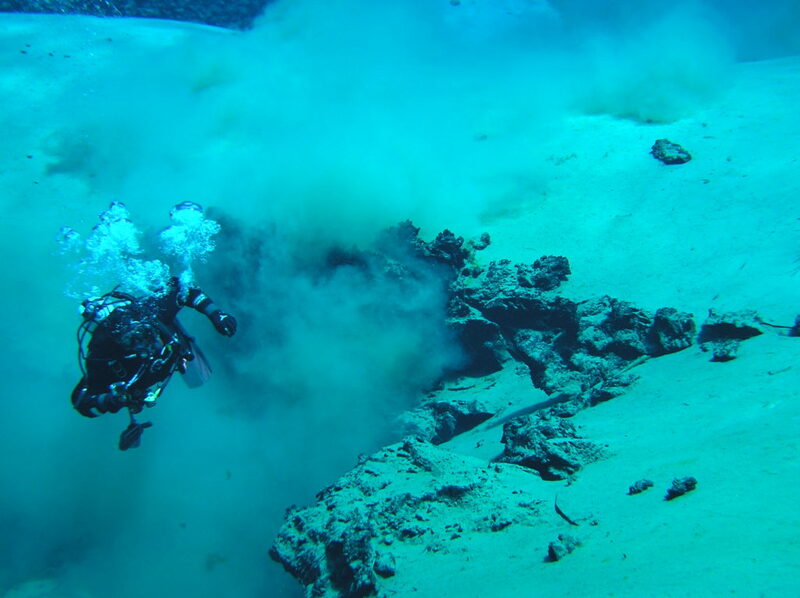 The dive site is at 3,000 feet above sea level. This is an intermediate level dive because of the potential for your regulator to freeze, the cold water, and the potential max depth. Open water divers should only dive this site if they have sufficient dives under their weight belts and feel comfortable in alpine lakes. Depending on where you park and which entrance you choose, you may be walking 1000 feet on pavement with your gear or a mix of pavement and forest path. While there are slopes, they are gentle. If the boat ramp is not available for SCUBA divers, you may have to do a lengthy surface swim (1000 feet) fighting the current past the boat docks. If you can use the boat ramp, you can start diving right away. There are some sunken standing trees in the north pool at Clear Lake. These trees were alive when the lake was formed. They got flooded out, died, and have remained standing ever since. Non-motorized boat traffic is more common in the summer on Clear Lake although we have seen a boat on the lake even in the winter. Many people fish at Clear Lake (including fly fishing) so watch out for lures and fishing line, and steer clear of areas people are fishing. There is some current coming out of the springs and by the lodge docks. You can swim against the current but be aware that you can get tired out from fighting the current for too long. Be sure to ask at the lodge before you use the boat ramp as an entrance or exit. We found flashlights to be useful to peer deep into the springs. Check out our SCUBA Gear We Use page for the gear that we rely on for diving in Oregon. Remember that this is an altitude dive and that with such cold water, your regulator can freeze. We had the first stage on one of our regulators freeze and free-flow at depth at Clear Lake once which required us to abort the dive and take the regulator in for servicing. You should be comfortable with ascending from depth with no air in case your regulator freezes and free flows! There aren’t any close local dive shops to Clear Lake. Bend, Eugene, and Salem are the closest towns with dive shops. You need to be self-sufficient at this dive site. The current coming out of the spring in the bottom of one of the potholes can make it difficult to maintain good neutral buoyancy. The lodge has some limited food options. Otherwise, you have to drive a long ways to find a restaurant. The lodge at Clear Lake rents cabins that some of our SCUBA friends have stayed at and gone diving from. Be sure to ask when you reserve a cabin what the rules are on dive gear. 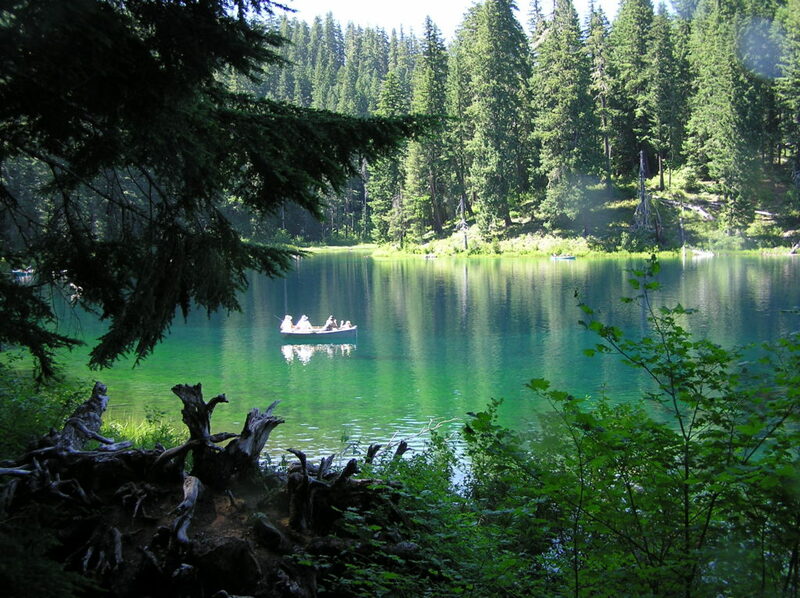 There are several public campgrounds around or near the lake run by the Willamette National Forest. There are also many forest roads in the area where you may be able to camp for free. Be sure to check local forest regulations before attempting to camp outside of a campground.